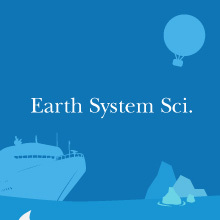 Home > Div.Earth System Sci. Division of Earth System Science offers students the opportunity to develop an interdisciplinary perspective on environmental issues based on Earth Science. 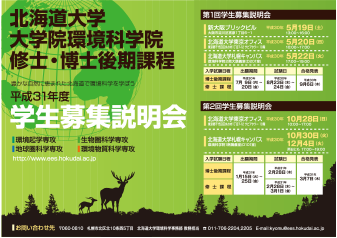 For those interested in scientific researches on local to global environmental problems, or simply those wishing to increase their awareness of environmental issues, the Division of Earth System Science proposes an excellent opportunity to participate in a dynamic, student-oriented form of education. The division consists of three courses: Course in Biogeochemistry, Course in Atmosphere-Ocean and Climate Dynamics, and Course in Cryosphere Science. Research interests of the stuff member in our course cover wide areas of chemical environmental studies. We are providing various opportunities to learn analytical chemistry in marine and atmospheric environments, atmospheric chemistry, chemical oceanography, isotope geochemistry and paleoclimatology, through frontier researches. Our goal is to understand phenomena and mechanisms of biogeochemical cycles in the atmosphere-land-ocean system on the basis of chemistry. For this purpose, we are challenging not only the current environmental studies but also reconstruction of paleoenvironment by the analyses of marine sediments, tree rings, and so on. Atmosphere-ocean system is mainly driven by the radiative energy from the sun. The process of the redistribution of the energy produces various phenomena with a wide range of spectrum such as daily weather, El Nino, global ocean circulation, etc. Although such phenomena in the atmosphere-ocean system play important roles in forming and changing our environment, there are still many unsolved problems. Our goal is to understand the physics of atmosphere and oceans, atmosphere-ocean-land interaction including the chemical processes and their roles in the earth system. We have many teaching staffs covering various fields: physical oceanography, atmospheric science, geophysical fluid dynamics, sea-ice and climate dynamics, who will make you possible to study various phenomena in the atmosphere-ocean system. You can study wonders and the mysteries of the changing cryosphere of the Earth, including Arctic and Antarctic, and learn cryosphere science while you belong to this course. The definition of the cryosphere is that portion of the climate system consisting of the world's ice masses and snow deposits. This includes the ice sheets, ice shelves, ice caps and glaciers, sea ice, seasonal snow cover, lake and river ice, and seasonally frozen ground and permafrost. The cryosphere acts as both an integrator and indicator of climate variability and change. The climate changes are being experienced particularly intensely in the cryosphere. Warming in the cryosphere is causing changes in nearly every part of the physical climate system. The increasingly rapid rate of recent climate change in cryosphere poses new challenges to all living species of the Earth.